Works ONLY with current Steam version. Would you mind explaining what that means? I'm still relatively new to using cheat engine, to be honest. Console commands, correct? Is it automatically enabled via ~ ? So I tried that and was still unable to find the correct address. Did you search for the initial value, spend/gain money, search again? I found it during the beta, but haven't bought the release yet. commands, correct? Is it automatically enabled via ~ ? Appreciate it. I found another trainer/table with unlimited suppressor so I'll use both, unless I go ahead and find the address and add it to your table. I didn't even bother to check the console during the beta, I just found all of the addresses. Quick thinking on your part! Yes I did the initial search, spent a little bit of money, and searched again. All with the double value type selected. I get results the first time I search but the second time I get absolutely nothing. Alright, it may be denuvo. Try a search with Type: ALL. If you can't narrow it down to 1 address, change the values of each address one by one while freezing it. Keep in mind, I'm a newbie as well. I can do pretty much any visual aspect (That has a number shown), but not stuff like hidden HP/MP/XP (with just a graphical representation). 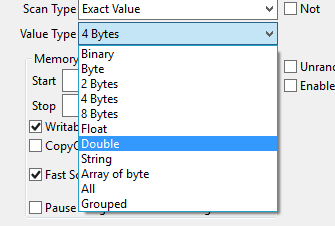 If I can never find an address with 4Byte or Float, I try ALL. If you've tried ALL, I'll check it out when I get the game downloaded it. I'm going to go buy it now, since I have funds in my wallet. Okay so I read elsewhere that in the final release money was a float value. So I tried it with that and it worked! Float worked? Awesome! Lingon uploaded a +12 trainer with Money, so there's that. I don't use his trainers though. When I do, it's when absolutely no one else has anything available or I can't figure it out on my own. And I don't use CH, paid trainers.. kek. Well damn, that's even more genius. I wasn't assuming you just checked for the dev console, was just thanking/praising you for finding what you did post at the time. That's one of hell of a method! And I'm still learning to read ASM, so those screens look like a foreign language to me at the moment. Last edited by ray2160 on Tue Sep 05, 2017 6:53 am, edited 18 times in total. Last edited by ray2160 on Sat Jun 24, 2017 10:41 pm, edited 1 time in total.